The results published in Light: Science & Applications open new avenues for fundamental studies of vibrational strong coupling, as well as for the development of novel infrared sensors for chemical recognition of very small amounts of molecules. 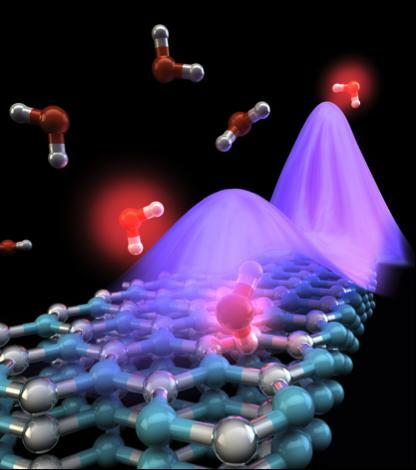 The interaction of light and matter at the nanoscale is a key element for many fundamental studies and technological applications, ranging from light harvesting to the detection of small amounts of molecules. During the last decades, many strategies have been implemented in order to enhance nanoscale light-matter interactions. One approach is based on concentrating light with the help of propagating and localized surface plasmon polaritons, which are collective electron oscillations in metals or semiconductors that are coupled to light. These electromagnetic excitations can concentrate light into nanoscale spots, so-called hotspots. At mid-infrared frequencies, they enable, for example, the detection of tiny amounts of molecules. This method is called surface-enhanced infrared absorption (SEIRA) spectroscopy. However, typical mid-infrared plasmonic structures suffer from large losses and do not achieve ultimate light concentration. An interesting but much less explored approach for enhancing nanoscale light-matter interaction is based on infrared-phononic materials, in which light couples to crystal lattice vibrations to form so-called phonon polaritons. "Phonon-polariton resonators offer much lower losses and field confinement than their mid-infrared plasmonic counterparts. For that reason, we decided to develop and apply infrared-phononic resonators to enhance the coupling of infrared light to molecular vibrations" says postdoc Marta Autore, first author of the paper. In order to develop a method that one could call "phononic SEIRA", the researchers fabricated a set of ribbon arrays made of hexagonal-boron nitride (h-BN) flakes. By infrared transmission spectroscopy they indeed observed narrow phonon polariton resonances. Then, they deposited thin layers of an organic molecule onto the ribbons. It led to a strong modification of the phonon polariton resonance, which could be used to detect ultra-small amounts of molecules (N-15 mol) that were not detectable when deposited on conventional substrates. "Interestingly, when we deposited thicker layers of molecules onto the ribbons, we observed a splitting of the phonon polariton resonance. This is a typical signature of a phenomenon that is known as strong coupling. In this regime, the interaction of light and matter is so strong that exciting phenomena such as modification of chemical reactions, polariton condensation or long-range and ultrafast energy transfer can occur" says Rainer Hillenbrand, group leader at nanoGUNE who led the work. "In the future we want to have a closer look into phonon-enhanced strong coupling and what we could do with it." The findings show the potential of phonon polariton resonators to become a new platform for mid-infrared sensing of ultra-small quantities of materials and for exploring strong coupling at the nanoscale, opening the way for future fundamental studies of quantum phenomena or applications such as local modification of chemical bond strength and selective catalysis at the nanoscale.